Why does MIDAS encounter an unexpected error and tell me that my IP address is blocked, immediately after install? 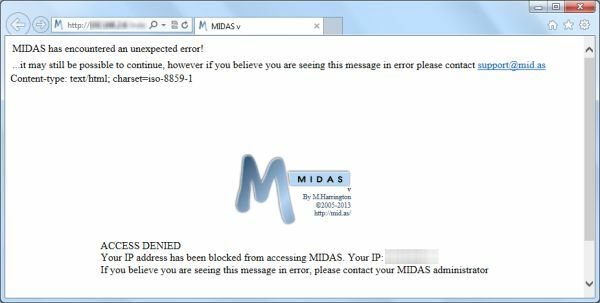 In the center of your browser window is the MIDAS logo, below which is the text "ACCESS DENIED: Your IP address has been blocked from accessing MIDAS"
It's important to remember that XAMPP is intended for use as a development tool only. 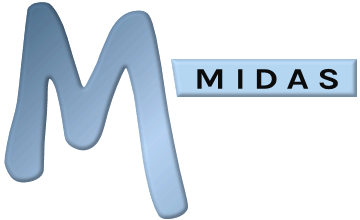 It is NOT a stable/production web server solution and should therefore not be used for MIDAS. The XAMPP package has a very limited set of Perl capabilities that are not suitable for running MIDAS. Please uninstall XAMPP, and install a production level web server instead. Once you've installed, configured, and verified these components, please re-install MIDAS, and your installation should complete without issue!